It was Jerome Kern who coined the famous maxism, ""Irving Berlin has no place in American music. He is American music."" Watching the remarkable life story of Irving Berlin unfold in a new documentary from A&E BIOGRAPHY, one can offer a variation on that Kern-ism: ""Irving Berlin has no place in the 20th Century. He is the 20th century."" At the dawn of the 20th century, Irving Berlin was among the thousands of immigrants pouring into New York's Lower East Side. In the century's early years, he was the plucky young newsboy who dreamed the American dream - Horatio Alger personified. In the 'teens, when Tin Pan Alley set the course for American popular music and channeled the power of ragtime, Irving Berlin was at the forefront. World War I found him a soldier in uniform. In the roaring '20s, he roared with the best, and gave Broadway some of its brightest melodies. In the '30s, he was in Hollywood, writing the songs that Fred Astaire and Ginger Rogers danced to in the great, timeless, silver musicals of t he silver screen. In the early '40s, the world plunged into war yet again, and Irving Berlin was there too: His musical revue, THIS IS THE ARMY, toured the most active corners of the war with the composer as its star, and song s like ""God Bless America"" and ""White Christmas"" confirmed his status as America's balladeer. The golden post-war years of the '40s and '50s, even the turbulence of the '60s and the uncertainty in the century's final decades, a re reflected in Irving Berlin's 101-year life story. But a story that provides its own incredible score - Berlin wrote over 1000 songs, after all! - and cameos by everyone from Ethel Merman and Bing Crosby to King George VI and Dwight D. Eisenhower, is a story that begs to be seen and heard, not simply read. And that is where A&E BIOGRAPHY stepped in. Produced and written by Michael Epstein, with Susan E. Leventhal and Carol Anne Dolan serving as executive producers, IRVING BERLIN: AN AMERICAN SONG premiered on A&E BIOGRAPHY on the night after the last Christmas of the 20th century. To do justice to its vast topic, A&E took the rare step of doubling the length of the program from one broadcast hour to two. It also received unprecedented access to the Berlin archives and inventory of the Irving Berlin Music Company in an arrangement negotiated with this organization. ""I'm a fan of BIOGRAPHY,"" says R&H President Ted Chapin. ""However, I realized that they seemed to shy away from composers and lyricists. So, I approached Susan Leventhal and offered to work with her on a program based on any o f the writers in our rather remarkable group. She said simply, 'Irving Berlin.' The Berlin family was ready to cooperate, allowing A&E to pore over the scrapbooks, the correspondence files, and the photo collection to a degree few ever had before. All three daughters also agreed to be interviewed for the program. The result, I think, is a candid but inspiring portrait of th is extraordinary American figure."" To tell the story, Epstein relied on numerous friends and family: In addition to Berlin's three daughters - Mary Ellin Barrett, Linda Emmet and Elizabeth Peters - Epstein interviewed Anna Crouse, widow of Broadway playwright an d Berlin collaborator Russel Crouse, and the irrepressible duo of David and Helen Gurley Brown, among others. Distinguished historians provided context and perspective, from Miles Kreuger and Robert Kimball to Berlin biographer Philip Furia. 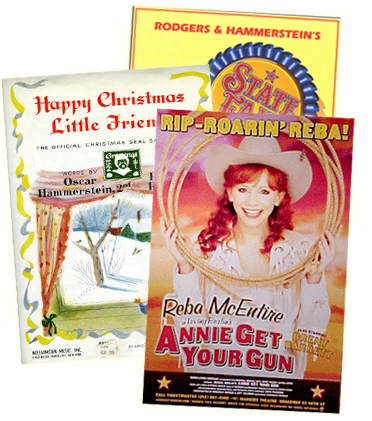 Notable as well were a group who knew Berlin's songs more intimately than most - performers like Bobby Short, Susannah McCorkle, Mandy Patinkin and ANNIE GET YOUR GUN star Bernadette Peters. Interwoven with rarely seen newsreel footage and photos, glimpses of Hollywood films and Broadway spectacles, and even the occasional appearance by Mr. Berlin himself, these interviews provided commentary of rich and fascinating insight. Mary Ellin Barrett, recounting family lore about the first time her mother m et her father: ""She said, 'Oh, Mr. Berlin, I do so like your song, 'What Shall I Do?' And he laughed, and told her the correct title, 'What'll I Do?' She was very embarrassed, and trying to make her feel a little better, he said, 'Oh, well, you know, where grammar's concerned I can always use a little help!'"" Bernadette Peters, on Berlin's versatility as a songwriter: ""He obviously ha d the talent of a writer who becomes what he needs to be at that moment...In a show where you're writing for the character, he could transform himself and do that."" Mandy Patinkin, on the significance of ""God Bless America"": ""I think only an immigrant could write how incredible the religion of your country is, and b y religion I mean, the life of your country."" Linda Emmet, on life at home: ""One day we were all at lunch together, and I had put my elbows on the table, and so my mother turned to me and said, 'Well, Linda, take your elbows off the table.' And I said, 'Well, Daddy has his elbows on the table.' And my mother said, 'Oh that's different - your father is a genius.'"" From the exhilarating highs of Irving Berlin's life - the stage and screen triumphs, the songs that marched across the ""Hit Parade"" - the documentary al so chronicles the lows: the deaths of loved ones, battles with self-doubt, the turmoil of an artist always pushing himself to keep ahead of what the public demands. By the 1950s, after decades of success, Irving Berlin stumble d against a new music fad. ""His last great hit show, CALL ME MADAM, came out just as rock and roll was starting,"" biographer Philip Furia recounts. ""Berlin had adjusted to every twist and turn of musical style for half a century. He couldn't adjust to rock and roll."" In his final years Berlin gained a reputation as a recluse, withdrawing from the world and - as some saw it - taking his music with him. But singer Susannah McCorkle saw it another way: ""He was protective of his songs; they were like his children."" IRVING BERLIN: AN AMERICAN SONG concludes, like a Berlin musical, with optim ism and hope. His life, long lived, was an astounding one, and the songs he composed will be with us...always. Looking into the future, Elizabeth Peters tells the viewer, ""I imagine that perhaps in 100 years they'll all be singing 'White Christmas' at Christmas, they'll be playing 'Always' at their weddings, and they'll be playing 'God Bless America' at the football games. These songs will be played all the time."" IRVING BERLIN: AN AMERICAN SONG is currently available from A&E Home Video, with a running time of 100 minutes and a retail price of $14.95... Visit www .aande.com or call 1-800-423-1212 to order. This product is currently unavailable for shipment outside the U.S. and Canada.